In March 2013 IFML specification has been adopted by OMG as a new standard. IFML has been designed by a consortium lead by WebRatio and comprising also Fujitsu, Model Driven Solutions, Softeam, and Thales. 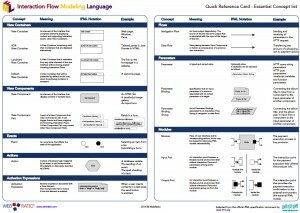 You can download a cheat sheet of IFML (courtesy of WebRatio and OMG) here. According to the IFML definitions, an IFML diagram consists of one or more top-level view containers, representing UI windows or Web pages. A view container can contain view components, which denote the publication of content or interface elements for data entry (e.g., input forms). A view component can have input and output parameters. A view container and a view component can be associated with events, to denote that they support the user’s interaction.